I was talking to someone recently who always wanted to travel the world, but they were too uncomfortable, or too scared, to do it. Maybe it was the strange foods, the different languages, the media fear that perpetrates the news that they’re going to die if they leave their safe little haven. It’s probably all of the above, but to let fear rule your life will get you no where. I write books. I’ve written them for years, but only in the past three years have I started to publish them. Why? Fear. Fear that people would laugh at me, fear that it’s not the “Great American Novel” and I’ll be ridiculed, fear of no sales, you name it. But one day something in me clicked. Maybe I got more mature, but I finally said “so what if it’s not the great american tale? I’m not Hemingway and I’m not trying to be him.” I recently read John Locke’s book on how he sold a million e-books and one thing really stuck with me. I need to stop worry about creating a book that is going to become a classic and write something fun, entertaining, engaging and will take everyone out of their everyday lives for just a little bit of time. If I’ve been able to accomplish that, it’s a success. That was a relief to read and I’m embracing it. (Not that I don’t want my books to get wide acclaim, and not that I won’t put out the best novel I can, but let’s take it one step at a time). Me talking to the kids at Mill Neck Manor School for the Deaf. Other things that scare people? Strange foods, daring situations, presenting in front of people… my feeling is, that if any single part of you wants to try something, you should try it. 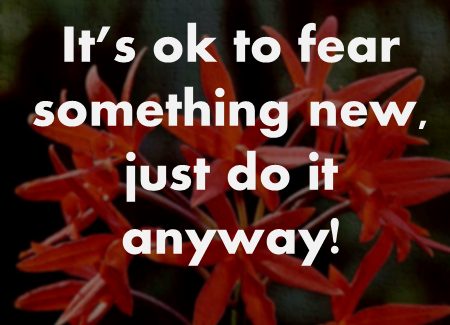 If fear is the motivating factor getting in your way, and nothing else, then you need to fight it. I tend to put myself in uncomfortable situations all the time. I go to events by myself because I want to try new things and sometimes other people won’t go with me. 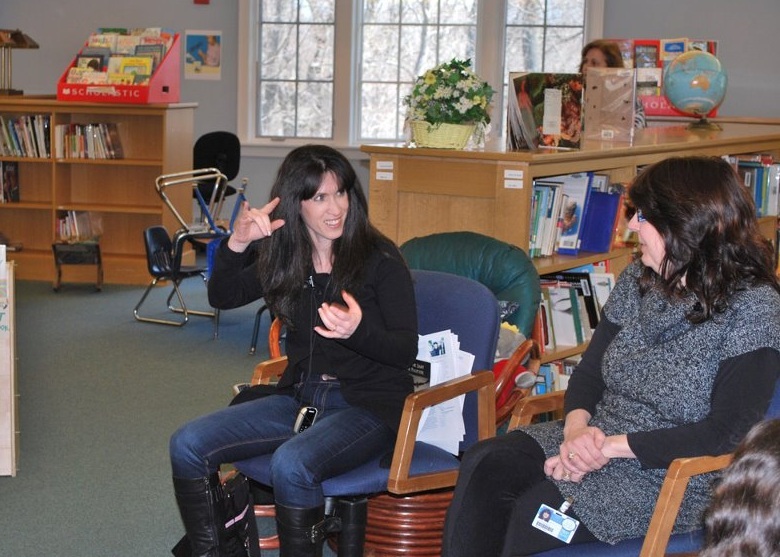 I spoke to children at two Deaf Schools, Mill Neck Manor and St. Joseph’s, about my YA thrillers and my Sign Language was not the best, but I tried. I feel like putting yourself out there is the only way to grow. Even a book signing is slightly terrifying. Strangers coming up to you to discuss something that you’ve put your heart and soul into. 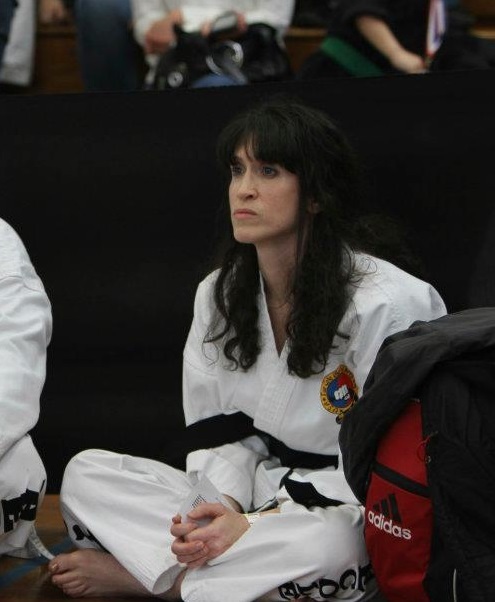 My first Tae Kwon Do Tournament – waiting to do forms. I look tough, but was SO NERVOUS. Now I realize I need to make another one and I’ve been thinking hard on what I want to put on it. So, what’s on your bucket list that you’d love to do, but are scared to do? Let us know – maybe we can convince you to try! I had the same fears about writing and it helps knowing that I or others like me are not alone. Thank you for posting this! You are most definitely not alone. That fear of rejection is probably the #1 fear of writers. But sometimes we just have to say “so what?” Go for it and good luck! I had the same feeling about writing and publishing but I’m glad I’ve let the first one free to roam where it will. As for bucket lists, I shudder. My son and I are travelling to New Zealand in a couple of weeks and I know, as in a bone deep certainty, that I will find myself standing on a platform somewhere near Queenstown with a bungy rope attached to my ankles (it was invented there apparently) and Sam saying ‘go on dad’ and at this remove I’m terrified so heck knows what I’ll be like on the day. Ah yes, the bungee jump fear – I hear you loud and clear. Please tell me if you end up doing it – I’d love to know how you felt afterwards! I expect the young horror will video me so it may well be a clip of sheer terror. Every time I’ve faced a fear, I’ve found that fear of the thing was worse than the thing itself. Except snakes. But that’s beside the point — great post, Lyse. There is nothing sadder than a book or a story that lies hidden in a drawer unread because the author was too afraid of criticism to let the work be read. Glad you pushed yourself to get out there and join the fray! The world is richer for it. Thank you, Frank. Sometimes it’s easier than said, but most times WE are our own worst obstacles, right? The Bucket List. Wow. Frank is right – Fear is the worst part of any experience. There are many things I want, but mostly, just to see my grandchildren get married and see my great-grandchildren come into the world and hold them. I’ve got a great family. I’m published. I’m a pretty good cook. And, otherwise, I’ve had a pretty good life up to this point and look forward to the future and anything it holds for me. You have pushed your limits and Elyse, you will continue to push the limit because that is the type of person you are. You’ve accomplished a lot. Good for you. Hey, sometimes you need to step back from the project, just give it some space to think about it, and then start again. You can do it! Jumping out of a plane – like, what if my parachute doesn’t open? Right? What a great post! My bucket list? Go to America, publish books, get married to the right person (not for the sake of getting married), write/coach/speak full time, lose 4 stone and keep it off – live a healthy lifestyle. Problem is, I have no belief I can do some of these. Some, I can do – publish a book, possibly even go to America and find a partner. But the other two or three (weight, write/speak/coach full time), I find it hard to believe could ever happen. Maybe I’m afraid of achievement, success. Maybe I’m afraid I could actually do this, and maybe I’m not patient or disciplined enough – probably a combination. But right now those seem very distant. Your achievements are truly inspiring Elyse, but I still lack confidence in many of my dreams coming true. Eventually, I learned to listen to that voice in my head that said “You know you’re a good writer and you have a story worth reading.” Now I just wish I had listened to it years ago. OHHHHHH… together we would be TROUBLE. As I was reading, I was *just* thinking ‘Oh I’m going to talk about how someone wise once said that in order to overcome something you aren’t very good at, or an area of weakness, you have to DO THAT VERY THING over, and over and over – – on purpose…” Then I read your thing about putting yourself in uncomfortable situations on purpose. We must have been separated at birth. I wrote a post a long time ago about how if people never get out of their comfort zones, they live in isolation and don’t even know it… http://www.extendedcircles.com/BlindIsolation.htm — Great post! Fears holds us hostage if we allow it. Great post.